“The less you know, the better.” It’s a common phrase used in all walks of life, and it applies perfectly to Nic Mathieu’s Spectral. This high-tech scifi film was originally planned as a theatrical release but has since been relegated to Netflix, possibly because it’s a movie based on a great idea that overshadows everything that could’ve made it amazing. 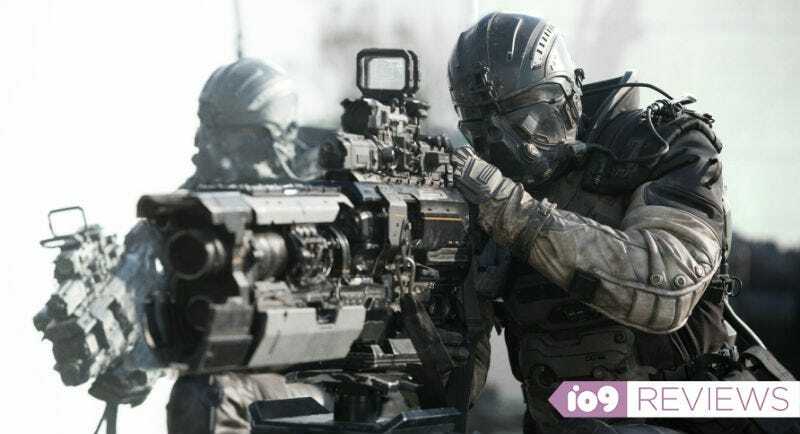 In Spectral, James Badge Dale plays a genius government engineer who is called to a war-torn Eastern European country when his advanced goggles spot something they shouldn’t: an unexplainable spectral being with a human form. Locals call them the “Ghosts of War,” suggesting they’re the tortured souls of the dead, and they may be right. But the beings are unstoppable and it’s up to him and a team of soldiers to stop them. There’s no denying that’s a pretty cool premise. A war story with a science fiction twist, Spectral does its best to deliver on that promise. But as the film goes along it’s a frustrating mix of high and low. The highs are many of the action scenes, which pit American soldiers armed like high-tech Rambos against an unstoppable ghost army. The lows are the rest of the movie, where the characters talk endlessly until they miraculously figure out what these beings actually are. Of course, in a movie like this, the audience is doing the same thing. We desperately want to know what these beings are and how our heroes are going to defeat them. It’s a nice mystery to have as a baseline for everything around it, but that’s almost all Spectral has to it. Almost everything in the movie is in service of answering these questions and, unfortunately, it comes at the expense of character building, emotional stakes, or a compelling story. Time and time again the film touches on intriguing stories, such as why Americans are in this area in the first place, or the main character’s anti-war sentiments. But those always go away in favor of long exposition scenes talking about the spectral beings. Each plot point is driven not by character, but by technology designed to defeat the enemy. Once Spectral puts together all the pieces and you get those answers, it’s actually kind of cool and interesting. But it never solves the fact that the entire film feels like the filmmakers were obsessed with this one mystery and refused to focus on anything else. Instead, they explain and explain and explain until you have a perfect understanding of what the beings are, and by that point everything else is lost. If we knew less, it would have been better. In addition to Badge Dale, Spectral stars Emily Mortimer, Bruce Greenwood, and Clayne Crawford, but each does little to advance the story. They’re just there as window dressing so audiences can potentially marvel at the visual effects and weapons design. If only as much attention had been paid to the rest of the movie, maybe Spectral would have been seen in theaters. Spectral is now streaming on Netflix.